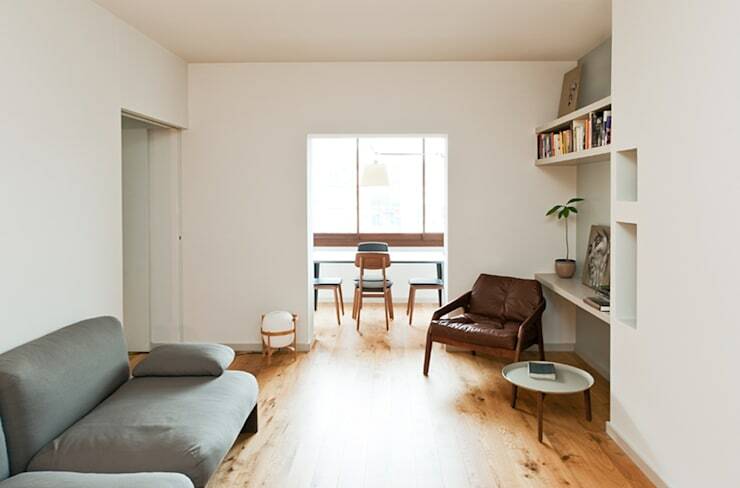 The home was composed of several small rooms with many that run along a single line. This meant that the living room functioned as a passageway and was subject to heavy foot traffic. 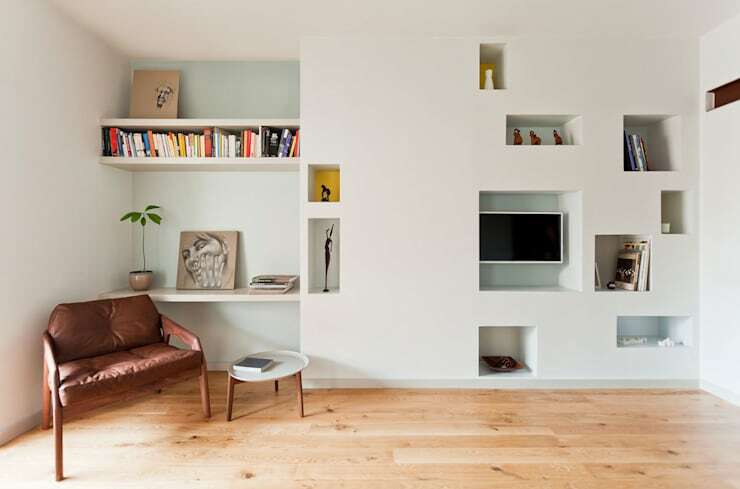 In response, the architects sought ways to create simple, striking built-in furniture features. This eliminated the need for excess furniture and allowed the occupants to move through the home without feeling moving around objects. In the living room here, we have a beautiful feature wall with inset wall shelves and a built-in desk. The inset shelves are presented as a collection of geometric shapes in varying forms. They aren't just functional they also add a modern, minimalist flair to the room. This obviates the need for wall decorations. The long and narrow home enjoys natural light from windows on two sides of the building. 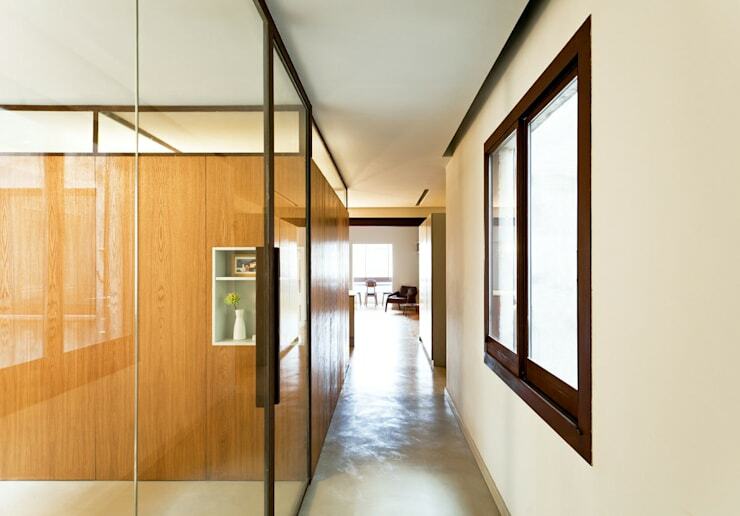 But with a standard internal wall, the home could have easily felt cramped. 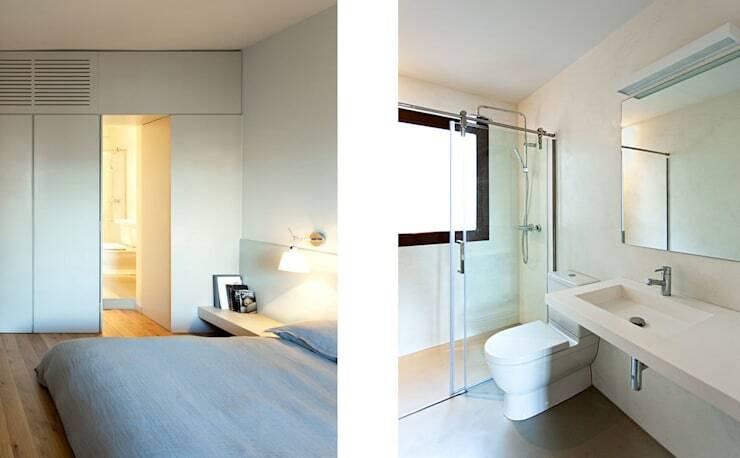 Here in the hallway that would have been most apparent, so the architects designed the guest bedroom on the left with a glass wall. It also has a large and thick curtain that can be accessed inside to provide privacy. When these curtains are pushed back, the light from the bedroom windows provides the brilliant illumination and sense of spaciousness we see here. The home has been extremely simply furnished. It has also been decorated with a pale and neutral colour scheme. This allows the simple beauty of the space to remain the focus. The architects were inspired by the quiet stillness of Japanese design and here we can really see evidence of this simple aesthetic. Note the soft grey sofa, retro chair and wooden features. These are all common elements in Japanese design. The apartment was rearranged to create another bathroom. This pushed the kitchen into the centre of the apartment and meant that the kitchen lost natural light. 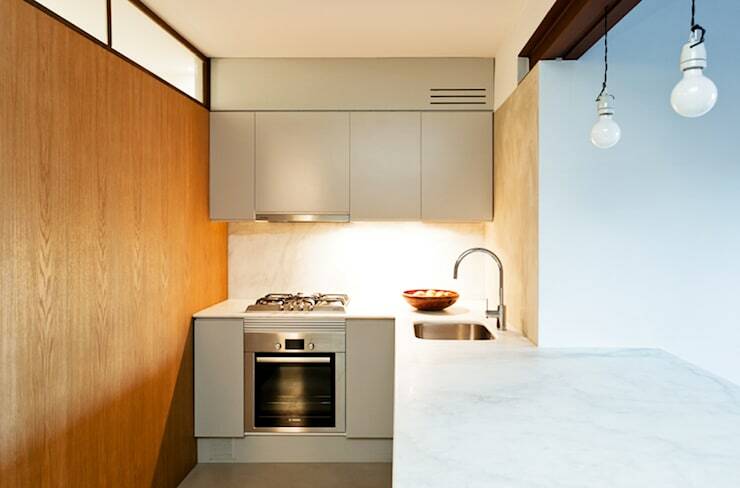 As an alternative, the architects designed a high-set window on the common wall between the kitchen and guest bedroom. It invites a whole lot of light into the kitchen without sacrificing any of the guests' privacy. In this kitchen, we also have a lovely bench that really hugs the wall. 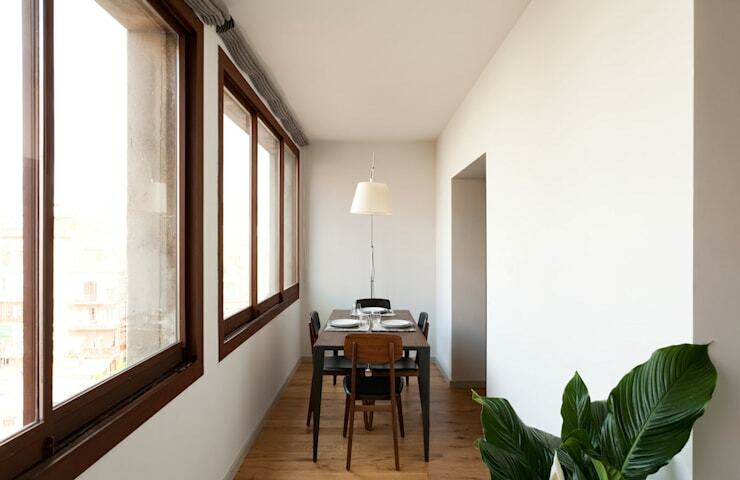 This is a very functional way of making a casual dining area in a small kitchen space. The dining room is one of the few rooms to have free-standing furniture. This little room has been very smartly furnished with a narrow dining table. Although there isn't any room for serving dishes, it's still a good use of this small space. Also, note the tall floor lamp. It uses up vertical rather than horizontal space. The bedroom has built-in bedroom storage units that run right up to meet the ceiling. They also make the most of the space above the doorway. These eliminate the need for free-standing furniture and really make the most of every inch of space. Finally, notice the bathroom. It may be narrow, but with a wall mounted sink and shower room, this bathroom feels positively luxurious! If this clever home design has you pining after some simplicity, check out: The simple home with a playful side. What do you think of the glass wall in this home?